Brian O Connell, based in New York, creates sculptures and photographic works based on resemblances and affinities with 20th century modernist thinking. New objects allow him to re-interpretate the conflict between the visionary and the utilitarian, whilst showing that the process of making and arriving at a statement can stay chaotic and poetical in nature. This exhibition brings together three groups of work that share an approach to the relationship between material, form and time more so than any specific content. Each group is comprised of second or third order appropriations – i.e. formal products based on the structure of previously available sources. 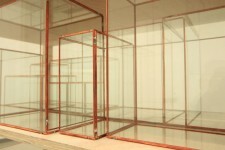 The first – Case 1.1-8 – is a wooden case of shelves holding multiple interpenetrating glass and copper boxes. Each box represents the volume described by the catalogue of the Scientific Instruments collection of the Museum of the University of Utrecht (NL). The second group is a set of large-scale wooden structures constructed with repeating wooden segments based on drawings used by cognitive psychologists in 1970 to study mental modelling based on our ability to recognize representations of objects at different degrees of rotation. The drawings on which these sculptures are based appeared on the cover of the February 1971 ‘Proceedings Issue’ of the journal Science. A large-scale colour ink drawing of this cover accompanies these pieces. There is a remarkable similarity of these drawings to those of artists of the time whose concerns were equally cerebral. Sergeant C.M. 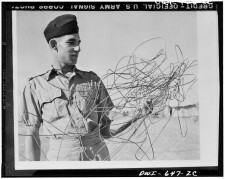 Battleship of Sydney, Australia, leader of a RAF (Royal Air Force) attack which destroyed six Junker 52s and damaged others at the El Aden airdrome, examining some of the telephone wire which was draped from the oil coolers, wireless masts, tail, and rudder if his plane when he returned to the base. Flying low over the road, he cracked through enemy telephone wires. This work is comprised of a silver plated knot of copper wire and a photogram produced by placing the object on colour photo-paper and exposing it under different filtering conditions. This knot is based on a photograph described by the title in the U.S. Library of Congress “American Memory” photographic collection. The jumble of wire is based on the topological structure of the 2-D knot of the photograph not the geometric shape of the knot pictured. 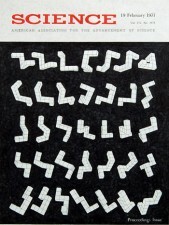 The show’s title is taken from a chapter heading of Henri Focillion’s 1934, The Life of Forms in Art.